The emperor of lies is building his own coffin, and there is no shortage of hands willing to drive a nail into it. Translated from Spanish by Marta Quirós Alarcón. Edited by Arielle Eirienne. Posted on March 16, 2019. Trump does not realize that his wall is actually Pelosi, who expects the president to fall after the election. He came to the U.S. presidency claiming that he was a winner, but lately, he has lost at everything. There is exhaustion in the air among the Republican troops, caused by Donald Trump’s clumsiness and ignorance. Thirteen members of his party voted with the Democrats in the House of Representatives to pass the resolution blocking his national emergency declaration in order to build the famous border wall. 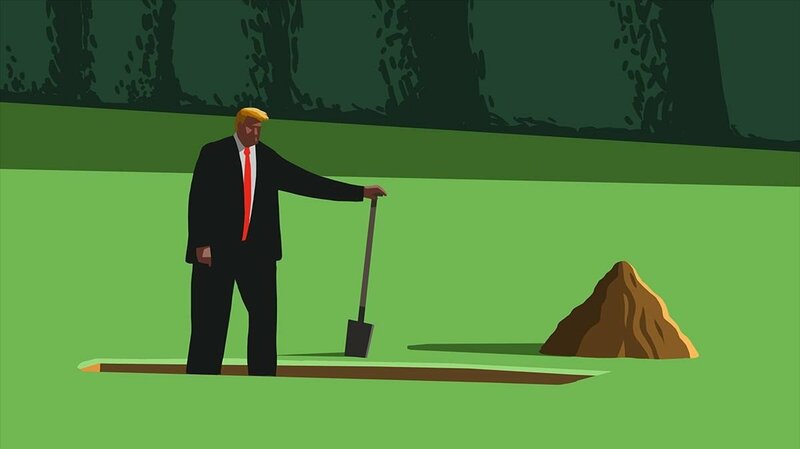 The emperor of lies is building his own coffin, and there is no shortage of hands willing to drive a nail into it, from Michael Cohen – who was his trusted lawyer for 10 years – to North Korean leader Kim Jong Un, to Special Counsel Robert Mueller. Less than two years away from the next presidential election, Pelosi does not favor impeachment, but Reps. Ilhan Omar and Rashida Tlaib – the first two Muslim members of Congress – confident that Trump’s actions are unconstitutional and are damaging the United States, signed a pledge in February to initiate impeachment proceedings. Moreover, the House Judiciary Committee sent 80 letters to institutions, political advisers, contributors and members of the president’s family on March 4 requesting any documents concerning his two years in office. Recipients include his son-in-law, Jared Kushner, former personal secretary, Rhona Graff, The Trump Organization Chief Financial Officer Allen Weisselberg and the White House staff itself. With friends like Cohen, who needs enemies? Trump’s former fixer for 10 years, a man who claimed he would “take a bullet” for him, has now implicated Trump in a string of potential federal offenses after calling him a racist, a liar and a cheat. The lawyer, who was hoping for a reduced prison term, was sentenced to four years in prison, and is awaiting trial in another case, where he faces an additional 10 years. No doubt Mueller, who is readying his investigation into Russian interference in the presidential election campaign, listened carefully to Cohen’s testimony that the president knew about contacts between one of his advisers and WikiLeaks, and about the scheme to leak the emails stolen from the Democratic Party, which is at the root of this new Watergate. These days, even the economic data appear aligned against Trump. The first crash came in the form of the greatest drop in retail sales since 2009 during a strong month for private consumption like December. This was followed by trade deficit and budget deficit figures soaring to exorbitant levels, even though Trump focused his election campaign on ranting against them, holding those deficits accountable for the evils in the American economy. To top it off, the job numbers, which have been his greatest plus, have deflated, and there were only 20,000 new jobs in February, compared to 180,000 that were expected. “I’m a tariff man,” he said a year ago, when he started the trade war with China. He was unaware that tariffs were abandoned during the past century for being ineffective and for feeding inflation. The trade war has been harmful not only for China but for the entire world, as it has driven a decline in trade. For the time being, Trump has backtracked and declared a truce until a deal is signed with Beijing, a deal that would give him some breathing space. The White House admits that the U.S. budget deficit will rise by 52.2 percent during the first three years of Trump’s term, which is unprecedented, except for wartime or after an extremely serious economic crisis. The cause is none other than the huge tax concessions for multinational corporations and the very wealthy. The man who stubbornly brought about the longest government shutdown in U.S. history wants the Nobel Peace Prize for a denuclearization agreement with North Korea, but the summit with Kim Jong Un ended abruptly. Once more, a lack of preparation contributed to failure, just like the many failures that forced the resignation of former Secretary of State Rex Tillerson and that of dozens of other senior officials. The White House smells like death, although Pelosi’s team would rather not take Trump out, preferring instead to let him crash and burn in the next election, and drag Trumpism down with him. *Editor’s note: President Trump signed a veto on March 15, 2019 rejecting the measure passed by the House and the Senate that would have reversed the national emergency he declared on the southern border. This article was published two days earlier, but the editors feel that its perspective remains relevant.